Antoinette Pope Bostic, 81, passed away on Monday, November 26, 2018 at Kitty Askins Hospice Center surrounded by her family. Mrs. Bostic lived a quietly regal life, humble, but dignified. She possessed an endless capacity for care, concern and compassion, always for her family and often for others. The eleventh of eleven children, this Sioux City native was a practical lady, not given to drama, spectacles or grand gestures, but approached life, and ultimately death, in the straight forward, matter-of-fact-practicality, long associated with mid-westerners. She was a coupon shopper who stretched her husband's income into a comfortably viable existence for her family. Mrs. Bostic was a wife-first, a mother-second, a friend-third, and a member of her community-fourth. As a wife, she provided the spousal support demanded by the turbulent 60s and 70s, and maintained the day-to-day organization that kept a family whole and solvent during those explosive times. She was the discrete, but powerful force that quietly kept the family machine operating. Mrs. Bostic might have been the original helicopter mom, paving the way for future generations of maternal war-hawks that provided both strategic and tactical protection for her offspring. She was subtle, demure and understated, until some perceived threat existed, then instantly fierce and unstoppable in protecting her children from the world at-large. Mrs. Bostic formed deep and lasting friendships with a circle of women that were vastly different from her, much older, well-traveled, and worldly, but was considered a very good friend that could be relied upon, was honest to a fault and never given to gossip or unkind words. 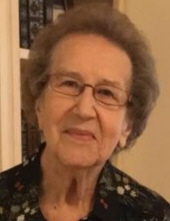 After raising her children and successfully launching them into adulthood, Mrs. Bostic served and supported the Salvation Army Women's Auxiliary for forty years and was a member of St. Mary's Catholic Church. Those that knew her at all knew of her kindness and gentle spirit. Those that were fortunate enough to love her, were showered with practical life lessons, most often taught by example, and the truest form of love returned, an endless depth of compassion for others' wellbeing. Mrs. Bostic will be remembered as an awesome wife, mother, friend and citizen for this world. Mrs. Bostic is survived by her husband of 62 years, Gene Bostic; daughter, Marie B. Crowder; son, Steven Carey Bostic and wife Karen Carver; grandchildren, Eli Carey Bostic (Tyler), Dakota Irwin and Rhiannon Bostic; sisters, Katie Codina, Josephine Blair (Frank), Mary Corio (Junior); and brothers, Frank Pope and Tom Pope; and many nieces and nephews she loved very much. A Mass remembering the life of Mrs. Bostic will be held on Saturday, December 22, 2018 at 11:00 a.m. in St. Mary Catholic Parish in Goldsboro. In lieu of flowers, the family suggests memorials be given to Salvation Army Women’s Auxiliary, 610 N. William Street, Goldsboro, NC 27530 or to St. Mary Catholic Parish, 1603 Edgerton Street, Goldsboro, NC 27530. To send flowers or a remembrance gift to the family of Antoinette Pope Bostic, please visit our Tribute Store. "Email Address" would like to share the life celebration of Antoinette Pope Bostic. Click on the "link" to go to share a favorite memory or leave a condolence message for the family.